Every short-order cook worth his or her spatula can make a patty melt. 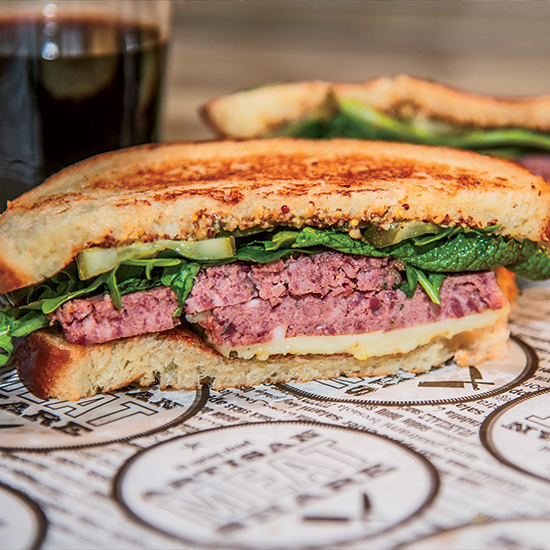 But chef Craig Deihl of Charleston, South Carolina’s new Artisan Meat Share knows how to transform this lunch-counter classic into an exceptional sandwich. Chef Craig Deihl likens his pork-liver pâté to what he calls “redneck junk food” meats like bologna. “That’s what you end up with when you get into whole-animal butchery,” he says. For his take on the patty melt, he drapes the pâté with warm, gooey Swiss cheese and finishes it with pickles, bitter greens and spicy mustard. Some chefs love novelty for novelty’s sake, but not Deihl. “I don’t want to make goofy, off-the-wall stuff,” he says. “I want to make a sandwich that I’d eat for lunch.” artisanmeatsharecharleston.com.